Technology is a tool, and when it’s combined with innovation and entrepreneurship it can help us change the world and improve the lives of everyone who lives on this blue marble we call Earth, and as our technologies become more powerful and sophisticated our ability to transform global culture, industry and society accelerates. View the poster online or download it here. Firstly, a big thank you to everyone who supported me over the past year to make 2017 my most enjoyable year yet, and here’s to a prosperous 2018 to you all. 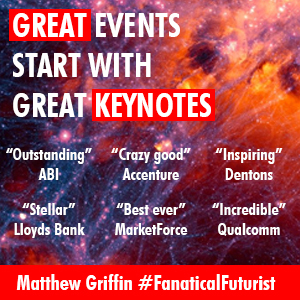 Building on the firm foundation of 2016 and 2017’s Griffin Emerging Technology Starbursts this year’s 2018 Starburst is the culmination of over a decade’s worth of ceaseless investigating, monitoring and tracking the appearance and development of new emerging technologies from every corner of the globe. It’s also clear that, year on year, the volume of new emerging technologies is increasing, and that their impact, power, and sophistication, and ergo their ability, to transform global culture, industry and society, especially as many of them become increasingly democratised, with a pace and voracity never seen before, is also increasing. 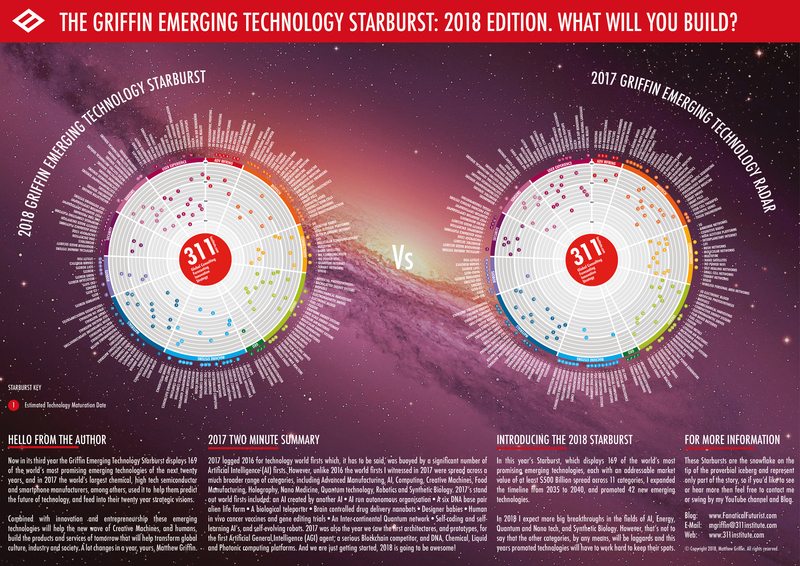 The 2018 Griffin Emerging Technology Starburst, with 2018-2017 Compare. They, whoever “they” are, say a lot changes in a year, computer chips get faster, displays get sharper, storage devices get larger, but a year in the life of emerging technology is like none other that you’ll ever experience. In many ways, it’s like watching technology development on steroids, with what seems to be a decade’s or more progress crammed into just a scant twelve months. And it gets faster and more furious every year. In this year’s Starburst, which displays 169 of the world’s most promising and coveted emerging technologies, each with an addressable market value of at least $500 Billion spread across 11 categories, I have expanded the horizon timeline from 2035 to 2040, giving you a clear 23 year view of what’s coming, and promoted 42 new emerging technologies that weren’t in last years’ Starburst. Among the hundreds of other emerging technologies I track these include, for example, a new, reconfigurable “unhackable” computer platform, a new communication technology that sends data without using signals, a relatively promising alternative to Blockchain, and six new types of computing platform, and all that’s for starters. By creating and publishing these Starbursts I’m hoping they help spark people’s imagination, and demonstrate to us all, young and old, rich and poor, that nothing is impossible. For example, a couple of years ago we researchers managed to download, upload and stream images, information and movies directly from people’s brains, using Artificial Intelligence (AI), neural interfaces and the latest fMRI technology, and elsewhere other researchers used these same technologies to build the world’s first human telepathic interface, then, last year, thanks to new developments in the field of lasers, optical sensors and quantum communications technology, researchers teleported photons 300 kilometers into space, and used nano technology to build the first prototype cancer hunting nanobots. And thousands more world firsts and breakthroughs besides. The Starbursts also have a more practical application though, and that is to help governments, individuals and organisations foresee new disruptive threats to their businesses, economies and industries, and to help them accelerate the development of new products and services. Signing off for now, if I could give you one piece of advice, from all my years of being a “futurist,” it would be forget what you know, open your mind and look forwards to what’s coming, because it’s going to be an awesome ride, and if you want to know more then you’re in the right place, check out my blogs, keynotes and videos, hold onto your hats and let’s go down the rabbit hole.